Born: Isle of Sheppey, Kent, England, April 3rd 1953. Began playing guitar 1967. After having spent a number of years in various areas of popular music (primarily 'folk', top 40 music and Country & Western), became involved with improvised music in 1978. Moved to Sheffield in 1979 and joined Sheffield Free Music Group. Subsequently joined 'new-wave/free-jazz' group Bass Tone Trap. Then went on to work extensively with (for example) woodwind player Charlie Collins in The Modum Quartet, The Bone Orchestra plus a regular duo and other ensembles; + Martin Archer in the electro-acoustic duo ASK and the extended sax quartet Hornweb. 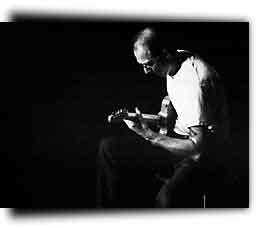 In 1988, took part in Derek Bailey's 'Company Week' at ICA, London. Went on to play many concerts in UK, mainland Europe and North America both as a soloist and with various ad hoc ensembles (with, for example, LaDonna Smith, Davey Williams, Paul Lytton, Louis Moholo, Jeffrey Morgan, Erhard Hirt). Current main activities are duo with instrument builder/sound artist Helmut Lemke and duo with drummer/percussionist Rob Dainton. Approach to guitar is a multi-instrumental one utilising a number of types of guitar and guitar-variants (as is common with woodwind players). No interest in instrument preparation or alternative tunings - more interested in using conventional guitar language (as I understand it) in a creative way.